Chungha wins for the first time on OH! Chart with a completely new concept and mature style. Hopefully there will be more music show wins to come! This week, a soloist from former group Bebe Mignon, Ben, led with 180 degrees as she scored 44,610,053 points. Meanwhile, second placer M.C the Max followed with 42,490,708 points with the release of After You’ve Gone. A new female soloist from girl group Blackpink, JENNIE, placed third scoring 37,208,717 points with her debut song Solo. While in the physical sales category, SM artists were able to dominate with their strong sales. With the continual support of the fandom, Jonghyun was able to maintain a top spot on OH! Chart with 26,154 copies of Poet | Artist sold. Next ahead is Ryeowook who sold 13,669 copies of Drunk on Love. Lastly, the only group among the soloists, TVXQ persevered with 10,214 copies of New Chapter #2: The Truth of Love sold. With the second week of OH! Chart relaunch, there were many who came to vote for their faves. OneHallyuers’ tastes certainly did not disappoint this week! They came to support the strongest release of this year. Chungha‘s Gotta Go ultimately had the highest number, scoring 90 votes. The next two artists maintained their longevity in the charts for several months. Not too far behind, Jonghyun‘s Shinin‘ had the second highest with 59 votes. And finally, Twice‘s Yes or Yes landed 3rd place with 52 votes this week. 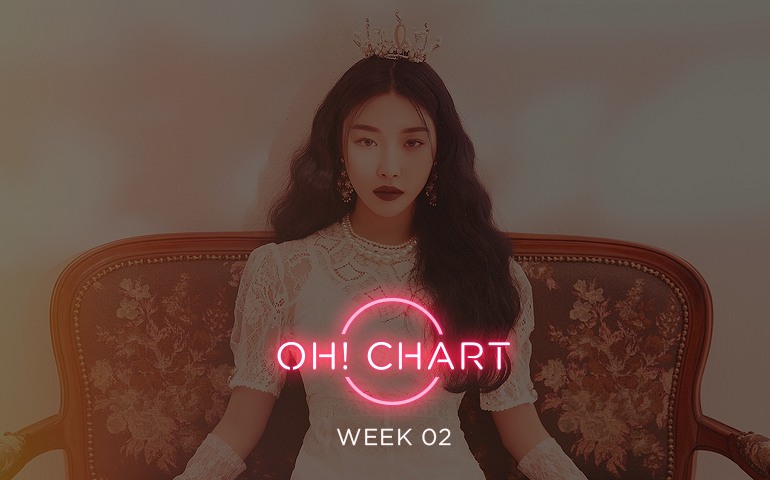 Chungha is the winner of this week as she tops the charts with a successful comeback. Her release of ‘Gotta Go‘ is a quality bop that deserves a first with its addictive chorus and instrumental. Despite her struggle to obtain a music show win, Chungha made her fans and family proud with this powerful comeback. WINNER‘s Millions is second place with strong digital and physical sales. Finally, 3rd place with a special shoutout to Shawols for their continuous effort goes to Jonghyun, with his song Shinin’. Chungha’s Gotta Go shocks us all with her first win on OH! Chart, proving that 2019 is her era. Can Chungha achieve another music show next week? Let us know your thoughts and predictions in the comments down below. Don’t forget to stream Gotta Go and watch all her performances! Note: There were technical errors in week 17 of OH! Chart on June 12, 2018. Changes to ranking and overall scores have been made accordingly.